Ever had a conversation on Skype and regretted not having resources to record the conversation for memories' sake? The Free Mp3 Recorder does just that, and much more. 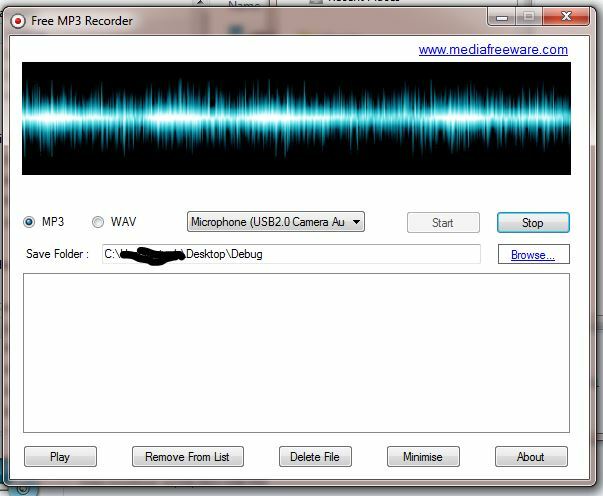 The Free Mp3 Recorder records audio from a computer. It could be from any source, like a video playing on your computer, a song playing on your computer, audio playing from the CD drive on your computer or whether you are speaking into the earphone mike. It can also record sound from other sources like TV or radio. Users can record songs on their computer and transfer them to their mobile phone. These songs can now be heard without the need of an internet connection. The Free Mp3 Recorder has a user interface that takes hardly any time to get acclimatized to. It serves the purpose for beginner, intermediate and advanced internet and software users. Apart from a user friendly interface, the Free Mp3 Recorder also sports many other features. The user can record audio real time. There is no need to convert the audio to wav format before saving it as an mp3 file. The file can directly be saved as mp3.The Free Mp3 Recorder also displays the files that have been saved, which makes it easy for review. The user can play any file from that very screen, instead of checking in the folder in which the file has been saved. Users can also remove files from the display list without having to delete the file from the computer drive. The Free Mp3 Recorder also gives users the option to delete files from the home screen itself. It has the option for the user to change the source of the sound, so it adjusts the quality accordingly. What makes the Free Mp3 Recorder is that it is a perform all related operations on one screen kind of software.